Burlington got a new café last week when Perky Planet Coffee made its debut at 170 St. Paul Street, on the corner of King Street. The café serves coffee, tea and espresso drinks, as well as baked goods such as cookies, cinnamon rolls and quiche. But its larger purpose is to help build relationships between people who have disabilities and the greater community, and to provide employment for the former group, said owner Richard Vaughn. "It's a venue for the community to come and get to know people with disabilities," explained Vaughn, 58. He lives in Milton with his wife, Christine, a special education teacher at Folsom Education Center in South Hero. Through conversations with her, Vaughn said, he gained an understanding of "what happens to kids [in special education programs] when they graduate from high school. "They have this amazing, inclusive experience all through school, and once they graduate — nothing," he said. "Their classmates go on to college, work life and the military. And we were trying to figure out some way to help with that." On a trip to North Carolina last summer, Christine visited a café run by people with disabilities. Her experience served as an inspiration for Perky Planet, her husband said. Of the seven people who work at Perky Planet, five have a disability, Vaughn said. This includes Vaughn himself: In 2013, he suffered a spinal cord injury that left him temporarily unable to walk. He has since regained use of his legs, but his four months in a rehabilitation facility "exposed me to the plight of people with a disability," he said. 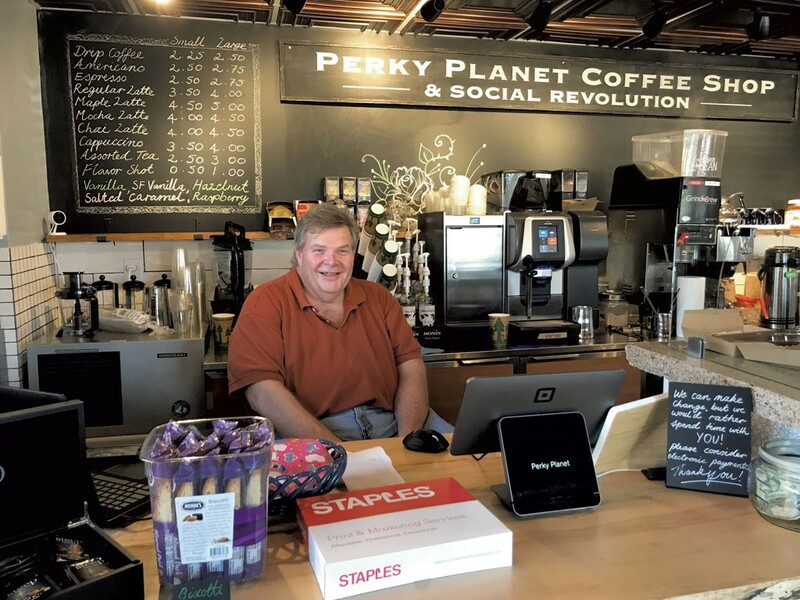 The two Perky Planet employees who do not have a disability sought out the café because they are young people who intend to work professionally with people who are disabled. "I think that's astounding," Vaughn added. "For folks, this job is not just a paycheck," he continued. "It's community, it's friendship — it's all those things that we take for granted." Perky Planet is the first of four eateries to open on the ground floor of its building, which is owned by Champlain College and houses about 300 students. The original print version of this article was headlined "Perking Up"